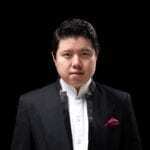 Huang Yi conducts the Shanghai Symphony Orchestra & NDR Elbphilharmonie Orchestra Principals in Serenade No. 1, op. 11, 1st Movement by Brahms.